TWO R-Rated MOVIES are out in the cinemas this week – The Predator and A Simple Favor. The Predator on the other hand is the latest from the sci-fi, action franchise seen for the first time in 1987 with Arnold Schwarzenegger leading the cast to hollywood blockbuster film history. The new film is not a reboot but a sequel that brings the universe’s most lethal hunters back on Earth. “The Predator”, directed and co-written by Shane Black, features lead actors Olivia Munn, Boyd Holbrook, Trevante Rhodes, Jacob Tremblay, Keegan-Michael Key and Sterling K. Brown. The Predator started very dull but delivers more action-packed sequences towards the end. I can’t say that I am happy with the story but it’s not too bad. It went to a direction that is much similar to “Power Rangers” or “Godzilla” – that’s why I didn’t quite understand why the producers went for bloody gore R when they could have toned it down to a PG. Minus the Aliens Vs Predators spin-offs, there were three (3) Predator movies before the 2018 version. The first Predator is still the BEST. 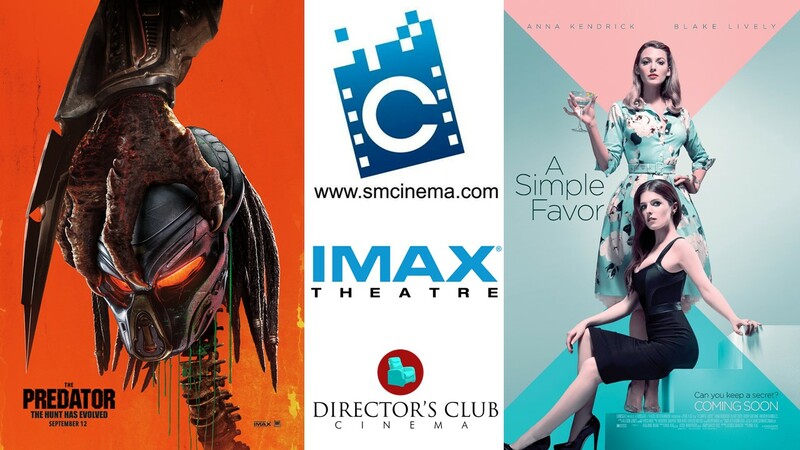 Experience the thrill of “The Predator” in IMAX and SM Cinema branch near you and solve the mystery of “A Simple Favor” in Director’s Club and SM Cinema branches nationwide. Book your tickets through the website, www.smcinema.com or download the SM Cinema mobile app. You may also follow /SMCinema on Facebook and @SM_Cinema on Instagram for updates!